Arnaudville, LA – Arnaudville’s Bayou Teche Brewing is releasing Saison d’écrevisses, (crawfish season ale) almost certainly the first beer expressly crafted to pair with boiled crawfish. This limited edition beer pays tribute to what is one of South Louisiana’s legendary signature meals. The beer is brewed as a Saison – a centuries old Belgian style of farmhouse ale. The new beer is the first in Bayou Teche Brewing’s new Lagniappe Series of limited-release beers. Lagniappe is the Louisiana Creole word that denotes the little bonus that a friendly shopkeeper might add to a purchase – an unexpected gift or benefit – and Bayou Teche Brewing promises a little lagniappe in every bottle. Saison beers are becoming quite popular – nationally many micro-breweries offer up a least one version – and are a very complex style of beer. Many of examples are very fruity in the aroma and flavor. The brewers at Bayou Teche suggest drinkers look for earthy yeast tones and a moderate tartness. Their own version offers up hint of spice and a medium bitterness. Saison d’écrevisses is semi-dry with a small addition of un-malted wheat added to calm the heat of all the cayenne pepper in an accompanying platter of boiled crawfish. It was only natural that the brewers would craft a beer to go with their favorite meal. 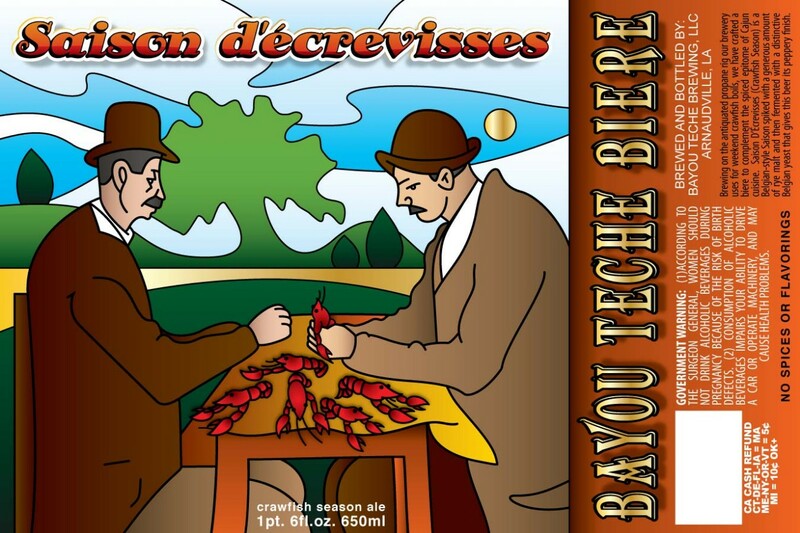 Bayou Teche Brewing’s limited edition release of Saison d’écrevisses is available in 22 oz. Belgian-style bottles and on draft during the traditional crawfish season (January to May) across Louisiana. The brewery expects to be able to offer the beer soon to their distributors in Mississippi, Alabama, Florida and New York.